Samsung has unveiled its new range of HDTVs to the US and it includes an LCD display that houses a world's first… And that world's first is: 1,000,000:1 contrast ratio. Just when you thought blacks couldn't get any blacker Samsung makes it so, and on a 120Hz panel. The LCD TV in question is the company's new 950 series, an update of last year's 81 model. This means that the TV keeps the LED backlighting but improves on the image processing. The sets also come with a generous four HDMI ports. These new HDTV models also join the growing line of web-savvy television sets – they are internet connected. This means you can stream media from your home PCs via an Ethernet connection. Samsung has also announced two new 8 series LCD TVs, 850 and 860. Though they don't have the fancy LED backlight they do come with a modest 50,000:1 contrast ratio and come with a red border (850) and a blue border (860). 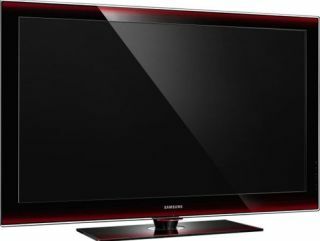 For those who prefer their TVs to be plasma, Samsung also unveiled a new 760 model. With its 18-bit color processing, the plasma matches the 950 series for contrast (that's 1,000,000:1 folks) and house the Touch of Colour design. The 950 series is available in August 44in and 55in sizes and priced at $3,200 (£1600) and $4,200 (£2100). The 8 series sets are available in September in 46in and 52in sizes and cost $2,700 (£1,350) and $3,300 (£1,650). The 760 plasma TVs are available from August in 50in, 58in, and 63in sizes and are priced at $2,900 (£1,450), $4,500 (£2,650), and $5,500 (£2,750). There's no word as of yet if and when these sets will be available in the UK.